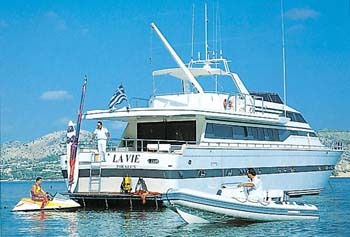 Built by Versilcraft, completed in 1991, LA VIE has an impeccable pedigree. 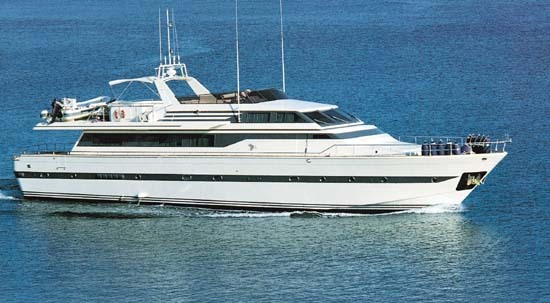 She cruises at 23 knots, is fully stabilized, and offers total comfort in all weather conditions. Three deck levels provide large indoor and outdoor living space for eight guests. The private sun deck is spacious, well equipped with built-in seating, outdoor bar and offers the first area for al fresco dining. The fore deck also has a cushioned area. On the main deck the sheltered aft section provides a second area for outdoor lounging and dining. 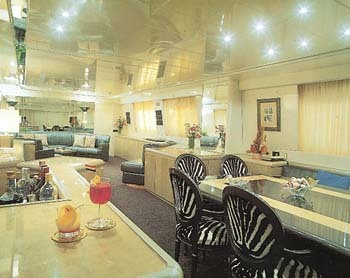 The large saloon, tastefully decorated in silver shaded upholstery, has unique "avant - garde" style and incorporates the indoor dining area which comfortably seats eight. Meals can be enjoyed in a fine and luxurious environment. A comprehensive range of communication and recreation facilities are provided on board. Whether choosing to relax, exercise or be spoilt by her professional crew of five, your charter on LA VIE is sure to exceed your expectations. ACCOMMODATION : Accommodation for up to eight guests in luxurious two full width staterooms each with a queen size bed, settee, and ensuite facilities, one of which has a bath tub. 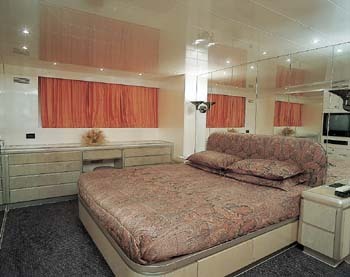 Two more staterooms are located aft; one with a double bed, and another with two singles. Both have en suite facilities.